Neptune SystemCare 2017 Free is world-leading PC tune up freeware with registry clean privacy protection and Windows optimization to fix slow computer problems.Providing main five features like PC Checkup System Cleaner System Tuneup Privacy Protector and System Monitor Neptune SystemCare 2017 Free gives your PC with a faster running speed a lighter CPU memory usage and a stable system performance. 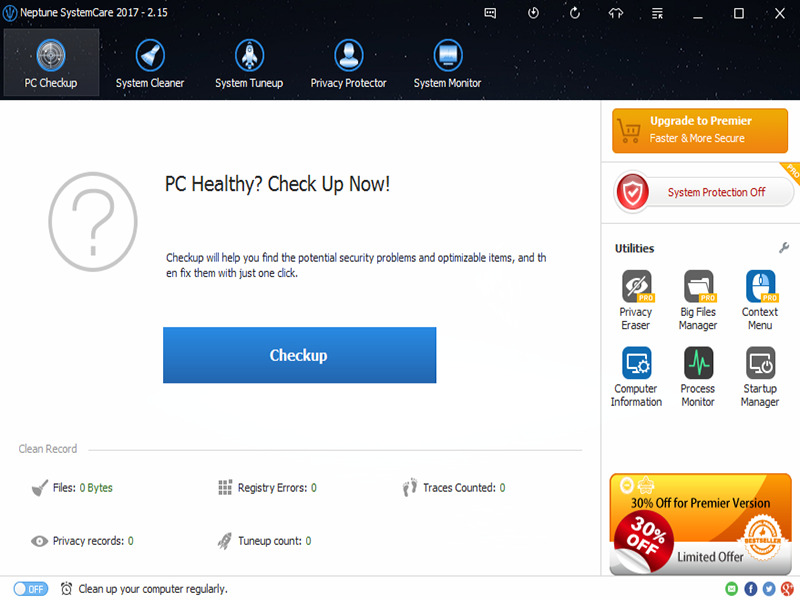 Neptune SystemCare 2017 Free adopts innovative technologies to develop the worlds fastest scanner and fixer to get you a clean and fast PC. System Tuneup tab optimizes Windows registry disk defragments manages startup program and context menu which roll the speed and stability of PC into a higher level. Besides System Monitor displays the panorama of both process and hardware ensuring you get a safer and smoother experience.